An Airbus A350-900 of Delta Air Lines had to abandon a high-speed takeoff earlier today at Shanghai Pudong Airport after a Japan Airlines Boeing 787-9 of the invaded the end of the same runway - 34L. The aircraft was operating flight DL582 to Detroit with 217 passengers and 15 crew members onboard at the time of the incident, all of whom have returned to the airport terminal and will be accommodated on an additional Delta flight departing tomorrow. According to the Civil Aviation Administration of China (CAAC) that Delta's Airbus A350 was about to take off at 1140 in the morning when a Japan Airlines aircraft 'invaded the runway'. During the aborted take-off, maximum braking was applied by the Delta flight deck crew and one of the aircraft's tyres burst. 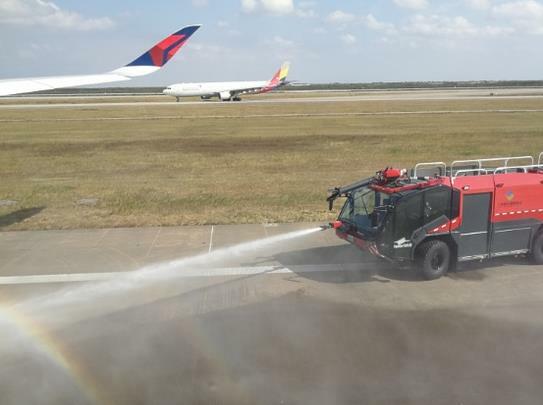 In videos circulated on social media by some passengers, Shanghai Pudong Airport's fire service can be seen spraying water over parts of the undercarriage. Local media sources are reporting that controllers had told the flight crew of the Japan Airlines flight to hold short of the runway, but it appears the crew did not comply with the instruction, however, this has yet to be confirmed at this stage. The Civil Aviation Administration of China (CAAC) has confirmed it is investigating the incident.